The best Veterans Day 2018 free meals list. Restaurants usually announce Veterans Day free meals offers in late October to early November. Veterans Day is Sunday, November 11th, 2018 and observed as a Federal Holiday on Monday, November 12th, 2018. See Veterans Day retail and online offers. Veterans Day Free Meals 2018 – Added Daily! 54th Street Grill & Bar Free meal up to $12.00 value with proof of service on November 11, 2018. Acapulco On 11/11 from 3 pm to closing, get complimentary meal which will be a 3-item combo, choosing among Tacos, Enchiladas, Taquitos, Tamales and Chile Relleno. Anthony’s Coal Fired Pizza Veterans and active military personnel receive a free 12-inch cheese pizza on November 11th and November 12th. Applebee’s free meal from a limited menu on 11/11/2018. Arooga’s Grille House & Sports Bar On Mon., Nov. 12, all veterans and active duty get a complimentary item from a fixed menu. Aspen Creek Grill all veterans and active duty military can select from a complimentary menu on 11-12-2018 from 11 am to 10 pm. Back Yard Burgers is offering its thanks to those who serve this Veteran’s Day with free Classic Burgers for the military. The offer is valid on Veteran’s Day – Sunday, Nov. 11 – for veterans and active duty service men and women in uniform or with a valid ID. Bagger Dave’s active, non-active, reservists, retired personnel, and first responders with proof of military identification get one Great American Cheeseburger and fries on 11/11/2018. Baker’s Square free breakfast on 11.11.18. Plus, vets who dine on 11/11 will receive 20 percent off the entire check, valid for their next visit by 11/30/2018. Bandana’s Bar-B-Q free meal on Sun. 11.11. Bar Louie free flatbread or burger on Sun. 11/11. Biggby Coffee On Nov. 11th and 12th BIGGBY COFFEE will be offering free 16, 20, or 24oz brewed coffee to active and retired military members. Ben’s Soft Pretzels‏ on 11.12.18 a free pretzel for veterans. Billy Sims Barbecue free Pulled Pork Sandwich, 1 Regular Side, & Drink for veterans and active duty on 11/11. BJ’s Restaurant complimentary entree under $12.95 on Sunday, November 11, 2018. Black Angus all day Monday 11/12/18 get an All-American Steak Plate for just $9.99 plus all the fixings and a non- alcoholic beverage. Bob Evans free select menu items on Veterans Day, Sun., Nov. 11. Bombshells Restaurant & Bar free meals for veterans on Nov.12, 2018, from 11 AM – 2 AM. 20% discount on meals for veterans families and active service members. Boston Market BOGO, buy 1 get 1 free individual meal and drink with Coupon on 11.11 and 11.12. Brann’s Steakhouse & Grille all veterans and active duty military get a free 6oz sirloin with a braked potato for on Monday, Nov. 12. Break Time veterans get a free medium fountain drink OR 16oz coffee on Sunday (11.11) and Monday (11.12). Bricktown Brewery $10 off for Veterans in uniform or with valid ID on 11/11 and 11/12. Buffalo Wild Wings free traditional or boneless wings and a side of fries on Veterans Day. Burntwood Tavern stop in and receive a free lunch or dinner on Sun., Nov., 2018. Calhoun’s special menu to choose from on Mon. 11/12. California Pizza Kitchen free entree from a special Veterans Day menu on 11/11. Cantina Laredo complimentary meal on Monday, November 12th. Carlos O’Kelly’s Veterans, Active Military & Gold Star families get a free entrée on Nov. 11. Cattlemens Steakhouse Sunday, Nov. 11th, Cattlemens Steakhouse current and former military can enjoy a complimentary 8 oz. Sirloin Steak dinner. CC’s Coffee House free tall brewed coffee for all Veterans & Active Military on 11/11/2018. Centraarchy Restaurants On Sunday, November 11 veterans and Active Duty military can receive a free entrée. Includes California Dreaming, New York Prime, Chophouse ’47, The Tavern at Phipps, Carolina Roadhouse, Joey D’s Oak Room, Burro Loco, Gulfstream Cafe, Chophouse New Orleans. Charlie Brown’s Steakhouse Veterans are invited on Monday, November 12th for lunchfrom 11:30am-3pm at all location’s. Please bring a valid military ID. Chevys Fresh Mex free complimentary meal on Veterans Day from 3pm to closing. Chicken Salad Chick free Chick meal and regular drink on Mon., Nov. 12. Chili’s Grill & Bar free meal from a select menu for veterans and active duty military on Veterans Day. Chipotle BOGO – buy one get one free discount for a burrito, bowl, or salad. Sunday, November 11th, from open to close. Offer valid for all active duty military, reserves, national guard, military spouses and retired military with valid ID. The Chop House On 11.11.18 & 11-12/18, veterans receive a 50% discount. Valid military ID required and does not apply to alcoholic beverages. Chuck E. Cheese Nov. 11 free personal 1-topping pizza for active duty, national guard, retired and veterans with valid Military ID or proof of military service. Cicis is offering a free pizza buffet meal with Military ID on Nov. 11. Circle K free Polar Pop on Veterans Day. City Barbeque free sandwich, two sides and a regular beverage. At participating locations only. Veterans Day only. Claim Jumper free entree from a special menu Monday, 11/12/18. Coffee Beanery free coffee Nov. 11 and Nov. 12. Connors Steak & Seafood On 11.11.18 & 11-12/18, veterans receive a 50% discount. Valid military ID required and does not apply to alcoholic beverages. Cotton Patch Cafe is offering a free Chicken Fried Steak or Chicken Fried Chicken with a drink to all veterans and active military on Veteran’s Day. Country Buffet vets eat free on Monday, November 12th plus a free bottled beverage. Country Cookin free meal on Tues., Nov. 13 from 2 PM – 8 PM. Cracker Barrel Old Country Store complimentary Double Chocolate Fudge Coca-Cola® Cake dessert or Crafted Coffee beverage on Veteran’s Day. Denny’s invites active and inactive military personnel to enjoy a free “Build Your Own Grand Slam” on Monday November 12th from 5 a.m. to noon with a valid military ID. Dunkin’ Donuts Free donut on Veterans Day. Duffy’s Sports Grill active duty and veterans receive a 40 percent discount off a food purchase on Sunday, November 11th from 5pm-closing. East Coast Wings + Grill select a free meal from their Veterans Menu on Sunday 11/11. Eat’nPark receive a special 10% discount for the entire month of November. El Chico Cafe eat free on Mon., 11/12 (Limit $15). El Fenix Active and retired members can select from three different meals on Veterans Day. El Torito & El Torito Grill free complimentary meal on Veterans Day from 3pm to closing. On Monday, Nov. 12, military members and their families can enjoy a free taco any Exchange Taco Bell or Taco John’s. Famous Dave’s is offering all military personnel and veterans on November 11th and 12th a free meal at participating locations only. Proof of military service required. Farmer Boys Veterans and active duty military with valid proof of service get a free cheese cheeseburger on Mon. Nov. 12. FATZ Cafe free Calabash Chicken Basket, Mon, November 12, 5pm – 9pm. Firebirds Wood Fired Grill free lunch or dinner entrée (free entree equal to or less than your purchase) on Monday 11/12/18. First Class Pizza veterans and active duty military get 25% off their order on Sunday, November 11th and Monday, November 12th, 2018. Dine-In, Take-Out or Delivery with proof of service. Villa Park, CA location only. Fogo de Chão Veterans receive 50% off Nov. 9-11. Friendly’s free breakfast, lunch or dinner on 11-11-2018. Furr’s Fresh Buffet vets eat free on Monday, November 12th plus a free bottled beverage. Glory Days Grill free appetizer or a regular boneless or grilled boneless wings on 11/11 or 11/12. Gold Star Chili free 3-way and drink on Veterans Day for veterans and active duty. Golden Corral free sit-in “thank you” dine-in breakfast, lunch or dinner on Sunday, November 11th, 2018. Gordon Biersch Brewery Restaurants current and former military can select from a complimentary Veterans Day menu, on Nov. 10-12, 2018. Graeter’s Ice Cream 11/11 all Veterans receive a free sundae. Granite City Food & Brewery free brunch on 11/11. Green Mill Restaurant and Bar free lunch or dinner dine-in meal on Veterans Day. The Greene Turtle free meal on November 11 on any item up to $12 or $12 on a more expensive item. Grub Burger Bar Veterans and current military can come in for a free burger on Veterans Day. Hamburger Stand free hamburger, fries and a Pepsi on 11/11. Handel’s Homemade Ice Cream free single cone for veterans and active duty military on Nov. 11. Hickory Tavern enjoy a free tavern burger with the purchase of a beverage on 11/11. Home Town Buffet vets eat free on Monday, November 12th plus a free bottled beverage. hopdoddy burger bar 50 percent off the entire bill for veterans on Nov. 11. Hooters free meal from select Veterans Day menu on 11-11. Hoss’s Family Steak & Sea House free meal on 11/11 from 11 am to 9 pm. Select from 4 meals. Houlihan’s free entree from a select menu on 11/11. Huddle House free order of Sweet Cakes to all active military members and veterans with proper I.D. from Friday, November 9 to Monday, November 12. The Human Bean free drinks for veterans at participating locations on Veterans Day. Hurricane Grill veterans and active duty military receive a complimentary entree from a select menu on November 11th. Hy-Vee free breakfast buffet during regular breakfast hours on 11-12 from 6 to 11 am. IHOP Mon., Nov. 12, from 7 am to 7 pm, free Red, White and Blue pancakes for veterans. Iron Hill Brewery veterans and active duty service members get a complimentary burger or sandwich and non-alcoholic beverage on Sun. 11/11 and Mon. 11/12. J. Christopher’s On Monday 11/11 with proof of service veterans receive a free meal. JJ’s Red Hots is offering a free combo meal to our nation’s veterans and troops (with valid ID) all day when Veterans Day is being observed as a federal holiday: Monday November 12, 2018. Joe’s Crab Shack this Vets Day all veterans enjoy 20 percent off. Jon Smith Subs Monday, Nov. 12 participating locations will offer a free 6-inch Steak Bomb sub to those on active duty or veterans in uniform. K&W Cafeteria a free meal with a choice of an entrée, two vegetables, bread and beverage from 11a.m. to closing on Monday, November 12. Ker’s WingHouse Bar and Grill Free meal on Veterans Day. Kolache Factory On November 11, Kolache Factory is offering free breakfast to all veterans and all those who are actively serving our country in the U.S. armed forces. Krispy Kreme free doughnut and coffee on 11-11-18. Lamar’s Donuts free donut and a 12oz coffee on 11-11-18. Lemon Shark Poke active and retired military & up to 2 family members get 25 percent off on 11.11.18. Little Caesars Pizza Sun., November 11, from 11am to 2pm, receive a free $5 hot-n-ready lunch combo. Logan’s Roadhouse free American Roadhouse Meal on Veterans Day. Not valid in CA, NC, SC or Augusta, GA, locations. Luna Grill from Sat. – Mon. (11/10 -11/12) veterans, military service men and women will receive their choice of a complimentary meal when they purchase a meal. Macaroni Grill is offering a free Mom’s Ricotta Meatballs & Spaghetti entrée this Veteran’s Day, Sunday, November 11th to Veterans and Active military personnel with military ID or proof of service. MacKenzie River Pizza 25% off the entire table on Veterans Day, at participating locations. Main Event Bowling Veterans and active duty military members receive free entree plus a $10 FUNcard on Sunday, November 11th. Offer also includes free shoe rental for veteran and four guests. Margaritas Mexican Restaurant complimentary entrees to all veterans and active members of the military, as well as their significant on Veterans Day. Max & Erma’s free cheeseburger combo meal and a soda on Sunday, Nov. 11th. McGrath’s Fish House Veterans and active duty get a free meal from a select menu on Veterans Day. Menchie’s free frozen yogurt on Veterans Day 11/11/18. McAlister’s Deli Sun., Nov. 11th all men and women of the military receive a complimentary entrée, drink and dessert. 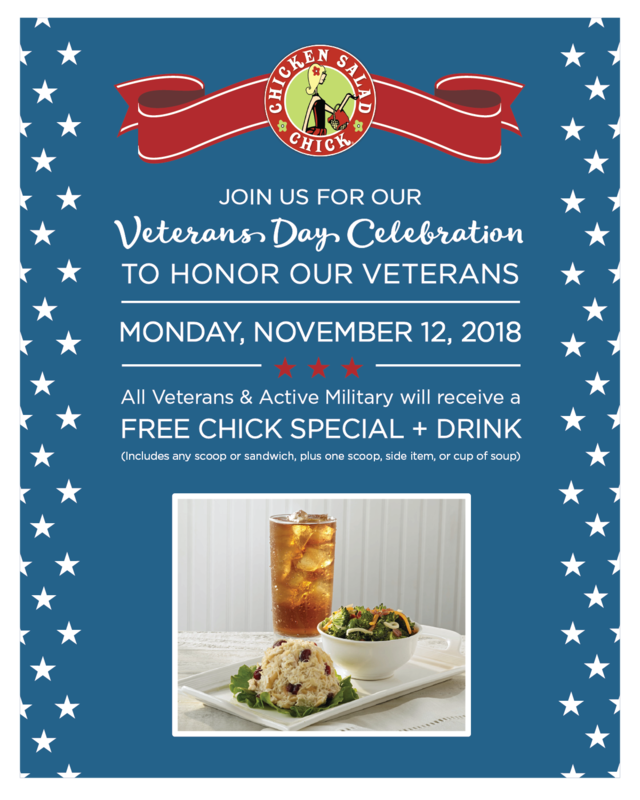 McCormick and Schmick’s free entrée for Veterans and Gold Star families on Sunday, November 11th, 2018. Mission BBQ free sandwich and cake on 11/11/18. MOD Pizza free MOD-size pizza or salad for veterans with military ID on Veterans Day. Native Grill & Wings one free menu item (up to $11.99 in value) on 11.11. Nekter Juice Bar Past and present military get a free 16-ounce fresh juice or Superfood smoothie on 11.11 18, at participating locations. Valid Military ID is required. Ninety Nine Restaurant & Pub a free lunch from the Real Size Entrées for $9.99 Menu with the purchase of any entrée on 11.11.18 from 11am – 4pm. NYC Bagel veterans can get a free bagel and coffee on 11/11 from 6 a.m. to 4 p.m.
O’Charley’s all active and retired military service members are invited to enjoy a free meal from O’Charley’s. Veterans can choose from O’Charley’s “Veterans Thank You Menu” all day on both November 11 and 12 simply by showing their military IDs. Restaurant participation may vary by location. 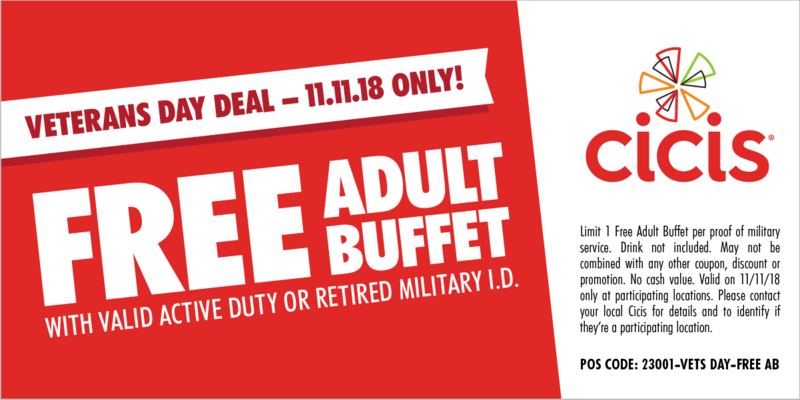 Old Country Buffet vets eat free on Monday, November 12th plus a free bottled beverage. On The Border Free Entree Free create-your-own combo meal at OTB’s for veterans and active duty military on Nov. 11, 2018. On Nov. 11th, all retired and active duty military receive a free froyo at participating locations. Outback Steakhouse free Bloomin’ Onion and a beverage on Veterans Day. Peet’s Coffee free small drip coffee or tea to members of our U.S. military and veterans on 11.11 AND 11.12. Petro Stopping Centers free meal, including a beverage. Mon., Nov. 12, 2018. Pilot Flying J Nov. 10–12, active-duty and retired military veterans can redeem an offer in the Pilot Flying J app to enjoy a free Pilot Coffee of any size with their choice of a PJ Fresh breakfast sandwich, packaged pastry item or a Cinnabon Center of the Roll. PJ Whelihan’s 11.12.18 free 10-piece order of wings. Price Chopper Supermarkets free coffee & donut on Veterans Day from 7am–7pm. Primanti Bros. free sandwich on Veterans Day. QuikTrip (QT) On Veterans Day enjoy a free fountain or hot drink. Current and former military, show ID at checkout. Rapid Fire Pizza Sunday, November 11th veterans and active duty military get a free single topping 9″ or 11″ pizza. Reasor’s free meal for veterans and active duty on Sun. 11/11 from 11:00am – 7:00pm. Recovery Sports Grill all veterans and active duty military are invited to enjoy a free meal on Veterans Day, Saturday, 11/11. Red Lobster free appetizer or dessert on Sunday and Monday, November 11th and 12th for Veterans, active duty military and reservists. Red Robin free dine-in Red’s Tavern Double Burger and Bottomless Steak Fries on Veterans Day. Rib Crib free meal from RibCrib’s Menu of Honor this Veterans Day. Rock & Brews free meal on Veteran’s Day. Rock Bottom Restaurants & Breweries current and former military can enjoy a free entrée 11/10 to 11/12. November 10th through November 17th .25 cents will be donated back to the community for every Veterans day IPA sold. Ruby’s Diner November 12, 2018 get a Ruby’s adult entrée on the house. Ruby Tuesday free appetizer up to $10 in value on 11/11/2018. Ryan’s vets eat free on Monday, November 12th plus a free bottled beverage. Sagebrush Steakhouse free complimentary meal from a select menu on on 11/11/18. Scooter’s Coffee Veterans past and present receive a free small drink on Sunday, 11/11. Shane’s Rib Shack Active duty and Veterans receive a complimentary sandwich, side, and 20-oz beverage at participating locations. Valid Nov.8th through Nov. 10th. Shari’s Café Free breakfast on November 11th. See Shari’s Pies response in the comments for offer. Sheetz this Veterans Day, veterans and active duty military can enjoy a free 6 inch turkey sub and a regular size fountain drink. Shoney’s offers a a free All You Care To Eat breakfast on Mon. 11.12.18 from open – 11 am. Sizzler Free Lunch free lunch and beverage on Veterans Day before 4 PM. Spaghetti Warehouse buy 1 get 1 free meal. Coupon can be redeemed from Friday, November9 through Sunday, November 11. Starbucks free tall coffee on Veterans Day for active duty service members, reservists, veterans and military spouses. Sticky Fingers Ribhouse on Sunday, November 11 Veterans can enjoy a free meal. Sugar Shack – Free Donut and coffee Sunday and Monday (11/11 – 11/12). Veterans and Active Duty. SweetFrog Frozen Yogurt Sun., Nov. 11, SweetFrog will provide a free 12-ounce frozen yogurt to all veterans and active duty personnel with a valid military ID. TA Stopping Centers free meal, including a beverage. Mon., Nov. 12, 2018. Taco Mac Veterans and active military get a free 6-pack of wings with a purchase of a beverage on Veterans Day. Tap House Grill this Veterans Day get a complimentary meal. Texas de Brazil 2 veterans dine for free plus 20% off for up to 6 additional guests at the table during dinner on 11/11/2018. Texas Corral Veterans and active duty service members can choose one entree from a special Veteran’s Day menu with ice tea, lemonade, or coffee on 11-11-18. Texas Roadhouse on Sun. November 11th, select from a special veterans lunch menu including a beverage and sides. Texas Steakhouse & Saloon free meal from a select menu Mon., November 12th. Thornton’s free cup of coffee with a military ID starting Nov. 9th through Nov. 11th. Tijuana Flats free entrée on 11.11.18. Tom Wahl’s active, reserve, or retired can stop by on Sun. 11/11 for a free Cheeseburger, Regular Fry & Regular Drink. TooJay’s eat free from a select Veterans Day menu on 11/11. Tucanos 11/9 – 11/12, free Churassco meal for veterans with the purchase of another adult Churassco meal. Uberrito free meal to all active & retired military personnel, including Reserves & National Guard, & all veterans. Valid only on November 11, 2018. Village Inn free breakfast on 11.11.18. Vitality Bowls a free smoothie for veterans at all corporate and participating franchise locations on Veterans Day. Wawa free coffee for veterans, active duty and family members on Sunday, 11/11. Weigel’s Stores Veterans can enjoy a free medium cup of hot coffee or cappuccino on 11-11 or 11-12. White Castle free breakfast combo or castle combo meal #1-6 on 11/11 or 11/12. Wienerschnitzel free Chili Dog with a small fry and a Pepsi on Veterans Day. Wild Wing Cafe 11/11 get a free Awesome Salad, Wild Wrap, Beefy Burger or Chicken Sandwich. World of Beer On Veterans Day enjoy a free select draught beer (where legal) or $5 off your check. Yalla Mediterranean active duty and veterans receive a free entrée. Yard House complimentary appetizer on Veterans Day. Yogurtology free 5 oz yogurt on 11/11. Ziggi’s Coffee on November 11th get free 16 oz drink of choice on Ziggi’s. Z’Tejas November 11th & 12th veterans get a $25 gift card to be used toward a future visit. Military ID required. Dine-in required.